Here is a great summer program for advanced undergraduate or beginning graduate student that are interested in monetary economics. Scott Sumner and I will be presenters and St. Louis Fed President Jim Bullard will be the keynote speaker. Your travel and lodging will be covered, but you need to apply by January 31. Alternative Money University (AMU) is an academic workshop for advanced undergraduate and beginning graduate students with a particular interest in monetary economics. During three days of intensive seminars, students will learn from leading scholars in the field about subjects not typically addressed in undergraduate or graduate economics courses — including topics in monetary history, the theory and practice of monetary policy, and the workings of unconventional monetary arrangements. Between them, the subjects covered and the seminar-style of the sessions are intended to provide students with a solid foundation upon which to build their own, future contributions to the field. Held in Washington, DC, expenses for attending AMU — including travel and accommodations — will be covered by Cato’s Center for Monetary and Financial Alternatives. Admission is limited to 30 students, who must be in or about to enter either their ultimate year of undergraduate study or their first year of graduate studies. Selections will be based on students’ academic records and demonstrated interest in monetary economics. Click here for more information. I hope to see you there! Do Changes in Potential Output and Data Revisions Make NGDP Targeting Impractical? Over the past few months there has been increasing chatter about the need for a new framework for U.S. monetary policy. The Peterson Institute for International Economics (PIIE), for example, recently had its Rethinking Macroeconomic Policy conference where, among other things, Ben Bernanke called for the Fed to adopt a temporary price-level target. PIIE also launched Angel Ubide's new book on reforming monetary policy. Similarly, at the AEA meetings there was a session titled Monetary Policy in 2018 and Beyond where Christina Romer again made the case for a NGDP level target. Likewise, the Brookings Institute held a recent conference on whether the Fed should abandon its 2 percent inflation target. There, Jeff Frankel shared the arguments for a NGDP level target and Larry Summers endorsed it. Others at the conference, like San Francisco Fed President John Williams called for a price level target. I am glad this conversation is happening. It is not new--some of us have been having it since 2009--but I get the sense that it is gaining traction. The turnover at the Fed and the opportunity it creates for new thinking makes this conversation about new monetary policy frameworks incredibly important now. As this conversation continues to grow, so will the interest in the options available including nominal GDP level targeting (NGDPLT). Obviously, I have much to say here, but for now I want to respond to two critiques often applied to NGDPLT: (1) changes in potential output and (2) data revisions make NGDPLT an impractical rule to implement. I think these concerns are misplaced as explained below. Critique 1: Changes in Potential Output: A Feature or a Bug for NGDPLT? [A]ny overestimation of the sustainable real rate of growth... could force [a central bank], subject to a level nominal GDP target, to soon have to aim for a significantly higher rate of inflation. Is that really what is now wanted? Bring back the stagflation of the 1970s...? Put differently, some worry that a NGDP target will not provide a stable nominal anchor. For these folks this is a bug in NGDPLT. This concern is unwarranted for several reasons. First, a NGDPLT target does provide a nominal anchor. It pins down the long-run growth path of nominal income. Put differently, it approximately stabilizes the growth path of nominal wages. Yes, it will allow more flexibility with inflation but as argued later that may be a good development. 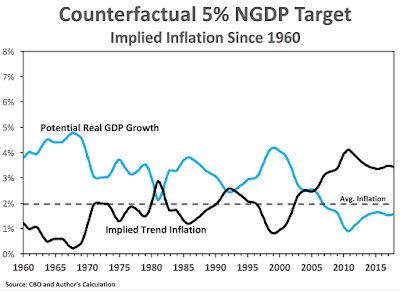 Second, on a practical level, a NGDP target would never have generated 1970s-type swings in inflation given the actual history of potential output growth. The figure below illustrates this point. It assumes a 5% NGDP target and takes the year-on-year growth rate of the CBO's potential real GDP measure (blue line) as given. The trend inflation rate (black line) implied by this counterfactual monetary policy is plotted in the figure. In this counterfactual, the inflation trend rate averages 1.97 over the entire 1960-2017 period. At most, it temporarily hits just above 4 percent right after the crisis. There is no 1970s inflation. Fears that a NGDPLT will bring back 1970s-type inflation is a red herring. 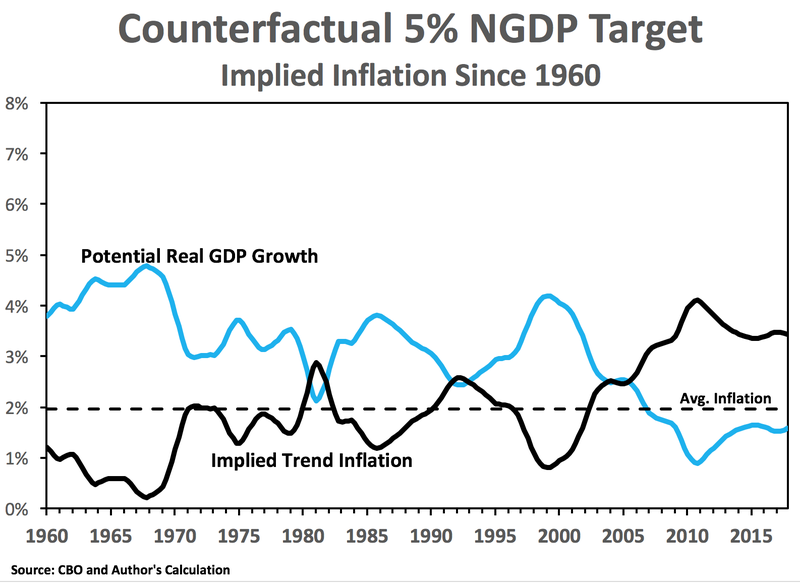 Interestingly, this counterfactual would have led to lower inflation in periods of high-trend real GDP growth periods like the 1960s and led to higher inflation in low-trend GDP growth periods like the present. 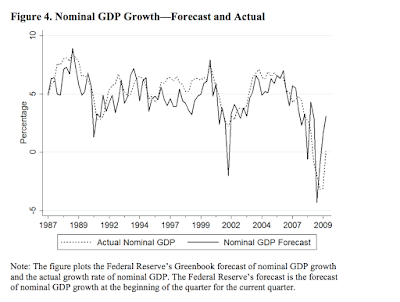 To the extent there is hysteresis and potential real GDP is not truly exogenous to monetary policy, the counterfactual higher inflation (as a symptom of higher nominal demand) may have actually reduced the collapse in potential output over the past decade.1 In any event, a NGDPLT since 1960 would not have led to soul-crushing swings in inflation that some claim. Monetary policy, as it is currently practiced, does not have freedom. Most inflation-targeting central banks loosely follow something like a Taylor rule where they need to know the output gap in real time. That requires knowing both real GDP and potential real GDP in real time--an impossible task. A NGDPLT acknowledges this ignorance and says to simply focus on stabilizing nominal demand. Potential output changes are therefore a feature rather than a bug for NGDPLT. There are two replies to this. First, as noted above, inflation targeting as it currently practiced requires real-time knowledge of both real GDP and potential real GDP. This Taylor-rule framework is therefore is also subject to data revisions. Moreover, it subject to two of them. A NGDPLT target, on the other hand, only faces one variable subject to data revisions. So if data revisions make NGDPLT impractical even more so for the current inflation targeting framework. 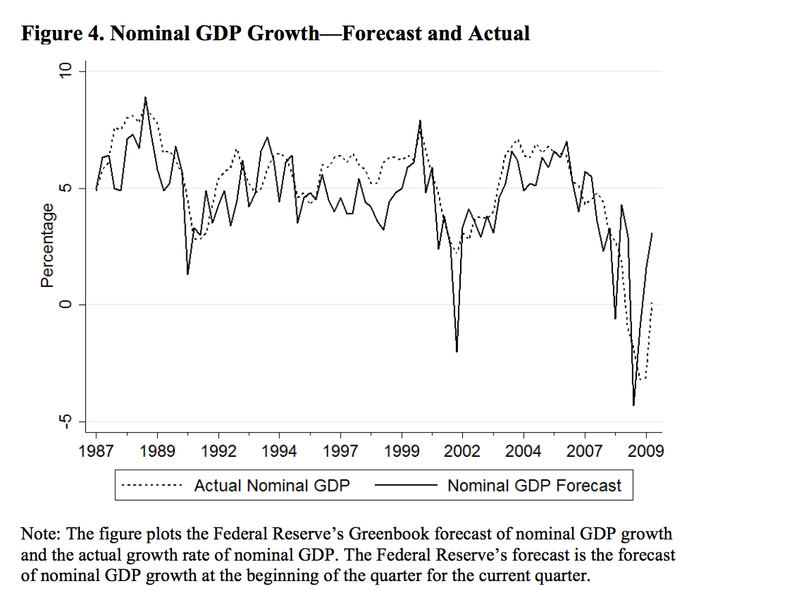 We also show in the paper that the Fed's forecast of the potential GDP is biased (i.e. the forecast error has a unit root). Consequently, the data revision argument against NGDP is not a convincing one, while it is a serious one for flexible inflation targeting. For me, then, I do not worry about the above two critiques. The real issue with NGDPLT, in my view, is how to credibly implement it. But that is a topic for another post. As commentator John notes, these problems could also be addressed by Scott Sumner's NGDP futures contracts idea. I would also note that directly targeting a monthly nominal wage index in the manner outline by George Selgin would be another fix. 1 A forceful case for hysteresis in the U.S. economy is made by Reifschneider, Wascher, and Willcox (2013), J.W. Mason (2017), and Coibion, Gorodnichenko, and Ulate (2017). 2There are other reasons why the countercyclical inflation created by a NGPDLT would be beneficial. It would lead to better risk-sharing between creditors and debtors as shown in Koenig (2013), Sheedy (2014), and Bullard et al. (2015). So the Federal Reserve is reporting that interest on excess reserves (IOER) payments hit $25.9 billion in 2017. This amount is more than double the dollar size of the IOER payments in 2016 as seen below. This increase is understandable given the rise in the Fed's short-term interest rate target and the size of its balance sheet. But, as I have noted before, this is horrible optics. For the largest recipients of the IOER payments are large domestic banks and foreign banks. As seen in the figure below, they hold most of the excess reserves and therefore earn most of the IOER payments. Put differently, the systematically-important or "too-big-to-fail" banks that were bailed out during the crisis and are still implicitly subsidized by the government as well as foreign banks are the main recipients of IOER. It gets worse. Note in the table above that the higher IOER payments are associated with declining remittances to the Treasury Department. The Fed, in other words, is allocating more funds to big banks and less to the public. This is easy fodder for the "Wall Street vs. Main Street" critics. Because of this, I suspect the IOER in its current form will be increasingly a tough sell to make to Congress. There is an easy fix to this problem. The Fed can move from its current floor system to a corridor system. 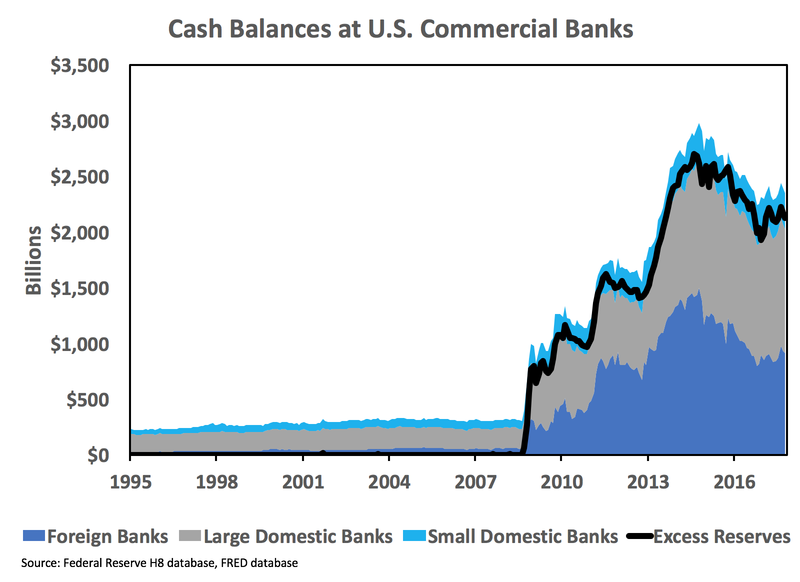 Under the latter, the balance sheet can shrink down so that there are few reserve balances in the banking system1. 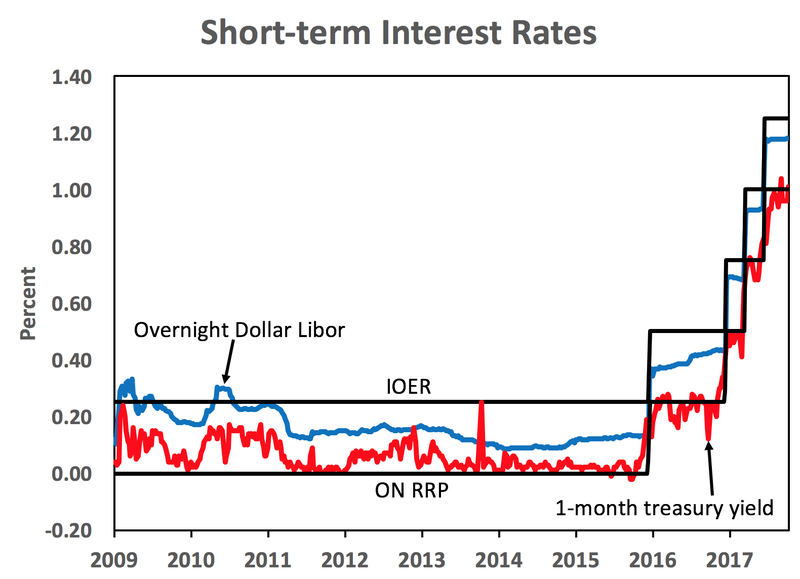 The Fed can still have IOER, but it would be less than short-term market interest rates.2 The IOER would set an floor for short-term interest rates and the Fed's lending rate would be the ceiling for short-term market interest rates. Together this would constitute a corridor system and give the Fed ample control over interest rates. Update: To clarify the difference between a corridor and floor system, here is a figure distinguishing the two approaches from the NY Fed. Note in both cases the IOER remains. 1Just because a corridor system would have fewer reserves does not mean it would necessarily be a "scarce-reserve" balance sheet. Reserve scarcity is not about the quantity of reserves, but about their supply relative to their demand. All a smaller Fed balance sheet does is affect the supply of reserves. The Fed can also reduce reserve demand by lowering IOER. Depending on how it adjusts IOER will determine whether there is reserve scarcity. Consequently, observers need to be careful to avoid automatically associating small reserve balances with reserve scarcity. 2In the current floor system, IOER is above short-term market interest rates and is the source of many problems with the system. P.S. George Selgin in Congressional testimony today makes the case for the Fed moving to a corridor system. Norbert Michel also makes the case in his testimony.